Make your own STORY GAME! When you talked with SimSimi, you've seen the story game once? Your story game is promoted to hundreds of people a day on SimSimi web page. A work that gets positive reactions will be able to play dozens or millions of people in SimSimi App. 2. Enter the above link and then, Click the "New" button. 3. Do you see the page for making a 'story game'? Please feel free to write down anything you can not fix at any time. This is a short-cut command but It has no special function now. Please enter a short, appropriate word. 6. Fill the contents with squares that are laid out like a card. One large rectangle is called a scene, and in it there are the following elements. If you've tried a story game once, you'll understand just the picture below. In this picture, If you choice "Okay, What happend", you go to scene 2, otherwise you go to scene 6, right? 7. Specify here the scene number that you will go to according to your choice. You can make this to link the contents. It's a continuous and connected story. 8. Write down the contents of several scenes and connect to each other. Since It's give it a shot, just make 10 scenes with 1 or 2 choice. 9. Add it when the scene is not enough, and Save it often. At first, only 10 scenes. If there is a shortage, add 5 scenes to press ① button. Do not forget to save draft ②. You may be upset when you lost everything. You can only submit stories with at least 10 scenes. 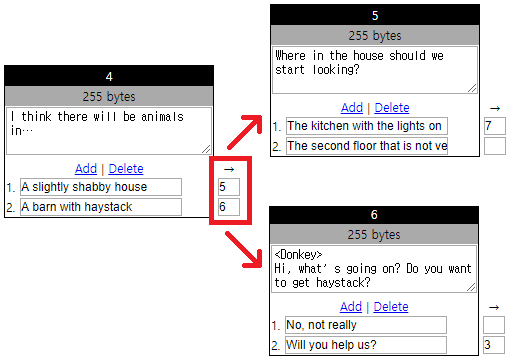 Once the submission is done, all SimSimi users will be able to play my story game. If you go to my game list, You can see how many people have used my game, which part is most popular, and see user's comments. It seemed complicated, but it is not difficult. Do you come up with your own ideas for story game? Click the link below to make one!